Every year we decorate with origami cranes, hand-folded by local volunteers, for Christmas at Castle Hill on the Crane Estate, a Trustees of Reservations property in Ipswich, MA. Each year, the stately home with its sweeping grounds, overlooking Plum Island Sound and Atlantic Ocean, tantalizes visitors with Christmas-themed lights and flourishes. Several florists and decorators volunteer to create customized arrangements and vignettes in the historic rooms on the first and second floors. Visitors can imagine sitting down at the dining table, stepping into a veritable wonderland, or slipping upstairs for a private moment in the bedroom. Fresh floral creativity and decorative installations draw out the holiday theme. Every year, our organization decorates the grand staircase. This year we’re welcoming “Christmas by the Sea.” Bright Happy Power is filling the grand staircase with starfish, flowing currents of ribbon, air bubbles, and a swirl of paper birds. Watch for photos! This installation is sponsored by Institution for Savings. 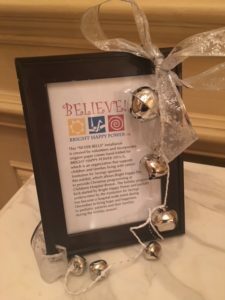 Their underwriting of the Christmas event at Castle Hill allows Bright Happy Power to provide winter holiday programming at Children’s Hospital Boston. The hospital’s holiday program — kick-started by Bright Happy Power and inspired by the book and movie Polar Express — has become a hospital-wide event during December. From the original one-day party on the oncology and stem cell/bone marrow transplant wings, it has expanded to several days of festive activities and is celebrated throughout the hospital’s inpatient units. This hospital holiday event, funded by the sponsorship of our installation at Castle Hill, brings hope and happiness to pediatric patients and their families during the winter season! What a wonderful trade-off: our volunteers spend a few days decorating for Christmas, in turn Bright Happy Power provides the launch-point for a much-cherished holiday celebration at the hospital! 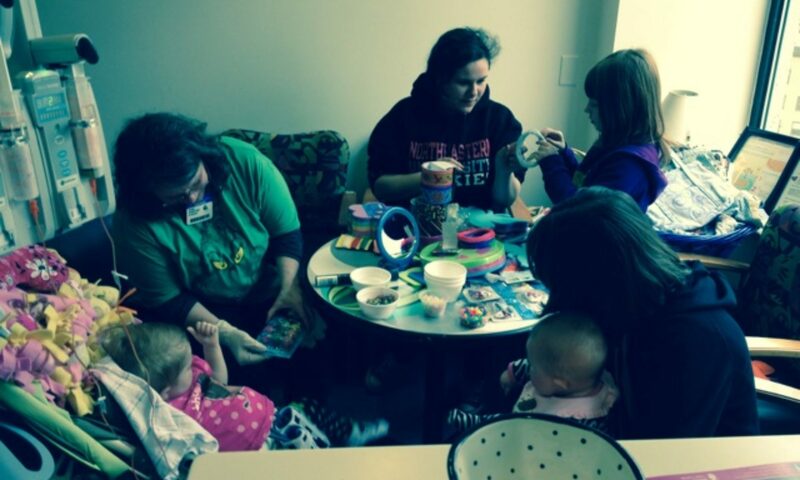 One specialists calls it her favorite week of the year at the hospital. 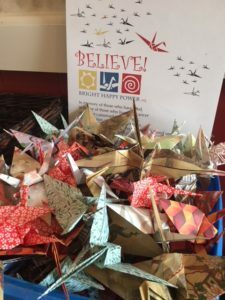 Every paper bird folded, every dollar donated, and every wish bell delivered … makes a difference to children and families who need the opportunity to BELIEVE!